[Left] The paperback tv movie tie-in version of author Ernest gaines' novel about a black woman's experiences from the pre-civil war era to the civil rights protests of the 1960s. 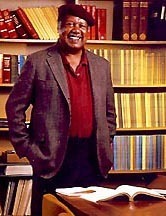 Above: author Ernest Gaines. 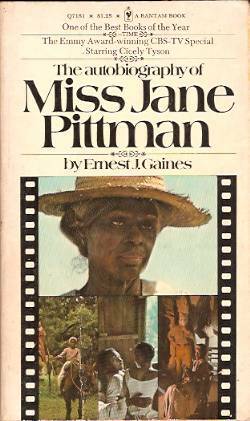 The Autobiography of Miss Jane Pittman was shown in in the USA on television during the 1973-4 season; it won nine Emmy Awards, including Outstanding Drama, Best Actress, Best Direction and Best Script. Its positive reviews and favorable ratings meant that it was given theatrical release in several overseas markets. Although the movie was intended for prime-time television (with consequent restrictions on content, language and budget) and is now four decades old, it's popularity is such that it is readily available on DVD and remains an impressive achievement - one of a handful of outstanding movies about race in America. It also ignited an interest in the issue of slavery and its consequences: without the success of Jane Pittman , it is highly unlikely that ABC studio would have financed the seminal mini-series Roots, which appeared on U.S. tv screens a couple of years later. 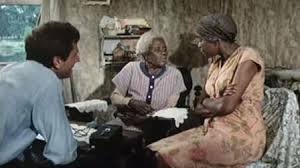 The movie covers the fictional life of Jane Pittman from a young woman to a 110-year old, incorporating crucial aspects of African-American history from the civil war to the 1960s. "Some people have asked me whether or not The Autobiography of Miss Jane Pittman is fiction or nonfiction. It is fiction. When Dial Press first sent it out, they did not put "a novel" on the galleys or on the dustjacket, so a lot of people had the feeling that it could have been real. ...I did a lot of research in books to give some facts to what Miss Jane could talk about, but these are my creations. I read quite a few interviews performed with former slaves by the WPA during the thirties and I got their rhythm and how they said certain things. But I never interviewed anybody." Gaines had the background to provide his fiction with authenticity and passion. Born in 1933, he was the fifth generation of his family to live and work on the River Lake Plantation in Louisiana, where, like his forebears he spend time picking cotton. Eventually he moved with his parents to California, eventually winning a writing scholarship to Stanford. His 1993 novel A Lesson Before Dying won the National Book Critics Circle Award. The novel includes several events and characters that are omitted from the brisk and taut narrative of the movie - the Spanish-American war, the first world war, the Vietnam war for example, and several real-life historical figures such as Fred Shuttlesworth. But the film carefully follows Gaines' novel in pointing out how the ending of slavery in law in the South meant its replacement during the next century by other forms of servitude and enforced racism. So we see through Jane's eyes the constant threat of violence directed against African-Americans (including the Ku Klux Klan and lynchings), denial of civil rights, the strict limitation of educational opportunities, the injustice of the sharecropping system which kept blacks in constant economic and social distress. It is the movie's finest achievement that it portrays so effectively and subtly the persistence of racial prejudice for over a century. It also shows that the abolition of slavery did not mean the abolition of discrimination, violence and prejudice directed against African-Americans in the legal, economic and social spheres. The movie is structured in a series of flashbacks based on Jane Pittman's tape-recorded interviews with a journaIST (played by Michael Murphy). The movie's climax involves Jane resolving her ambivalent attitude to the civil rights movement. Jane recalls her experiences as a slave girl during the Civil War; her re-naming experience one year before the Emancipation Proclamation; her abortive trek to freedom in Ohio; her years working as a field hand; her brief period of happiness as the wife of Joe Pittman, a black cowboy; her sorrow over the murder of Ned, a schoolteacher who tried to establish a school for blacks in the early 1900s; and her mixed feelings about black activism in the civil rights movement. Crucially, the film does not fall into the trap of portraying African-Americans as victims. The recent 12 Years a Slave may be much more explicit in its depiction of slavery but ultimately its hero is rescued from his situation by the efforts of a kind white man. But Jane Pittman instead shows Jane, Ned and Joe as forceful and determined individuals, determined to take steps to improve their situation and taking a stand against oppression, racism and violence. In the end her achievement is the culmination of the efforts of determined African-Americans like herself over many years, rather than white benevolence. Thanks to both Tracy Keenan Wynn's script and Cecily Tyson's acting, the character of Jane never becomes a symbol or a stereotype. She is abrasive, stubborn and speaks her mind regardless of people's feelings. Nor does she become a sentimentalised figure as she ages. In fact, she inspires affection and exasperation together. It could be argued that Autobiography downplays the evils of slavery, racism and segregation. And whites in positions of authority are presented as ineffectual and bewildered rather than as brutal tyrants. But it was obviously initially aimed at family audiences. Thus sexual exploitation is only subtly hinted, there are no scenes of whippings, mutilation or other barbaric slave punishments. Yet this restraint has the effect of making the movie's relatively few scenes of overt violence - a lynching, a KKK burning, a contract murder carried out casually and regretfully - all the more effective and troubling. One of the best things about Autobiography is the way it seamlessly integrates some key aspects of the long struggle for black civil rights since the civil war. A crucial character and a sub-plot involve the attempt to provide improved education for negroes in the face of determined white opposition to deny them schools and schooling. Another pivotal character, Ned Pittman, is a cowboy, an occupation which was inevitably portrayed in movies as an exclsively whites-only job. Yet 20-25% of post-1865 cowboys were African-Americans, many of them specialising -like the film's Ned - in the dangerous job of horse-breaking. 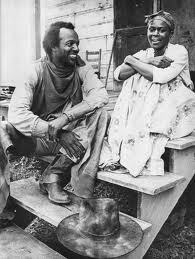 Autobiography was one of the first films to acknowledge the role of the black cowboy in the south-west. The film's climax selects the early 1960s civil-rights campaign to integrate public facilities such as toilets and drinking fountains. Although sit-ins and freedom rides have captured most attention in movies, the film uses a fictional campaign to highlight differing generational black viewpoints about public protests such as these, as well as reaffirming Jane Pittman's qualities of resolution and determination, and her acknowledgement that the fight against racism in the 1960s was built on the foundation of the efforts of ordinary people in the past century. John Korty, director of Autobiography of Miss Jane Pittman, originally made his name as a director of small independent movies in the years before the Sundance festival enabled greater public awareness of this type of movie. He established a base in the San Francisco area, and for a time asociated with Coppola and Lucas. He was one of the first to use the Marin county area as a film-making base.But his two Hollywood feature films - Alex and the Gyspsy and Oliver's Story - flopped at the box-office and he has spent most of his career making very well-received TV movies, often about contentious issues: race, adoption, prejudice. As Pittman illustrates, Korty's films show quiet and restrained craftsmanship, and an ability to get the best out of actors and value out of limited budgets. He won an academy award for his documentary Who are the Debolts? John Korty, Jack Lemmon and Genevieve Bujold in the rarely-seen 'Alex and the Gypsy', 'Who are the Debolds? ', his animated feature 'Twice Upon a Time' and 'Oliver's Story', an unsuccessful sequel to the hit 'Love Story'. The movie requires actor Cicely Tyson to age from a spritely young woman of about 23 to a frail but feisty 110 year-old. As she is onscreen and the focus of the camera's attention for most of the movie, Tyson's ageing process had to be subtle and convincing, especially when it shows her as a centenarian. It is one of the film's many triumphs that this was achieved, thanks to the work of makeup artists Rick Baker and Stan Winston, who together won an Emmy for their efforts. However, the impact of Tyson's performance doesn't rely on makeup or prosthetics; it is achieved through a remarkable expressiveness of her eyes and face, and using a wide vocal range. 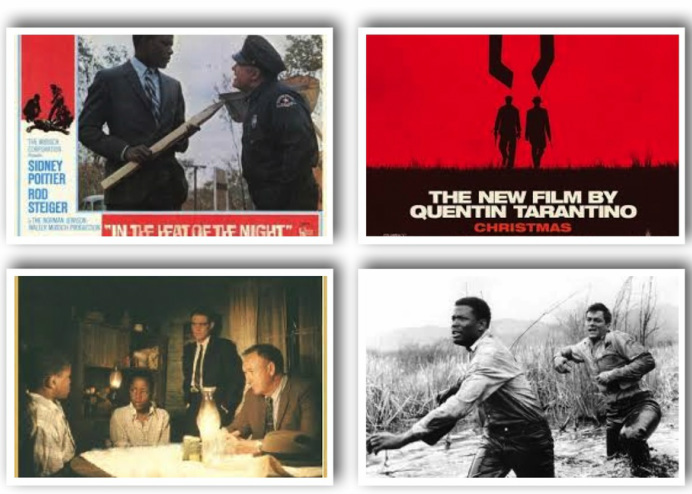 Clockwise: In the Heat of the Night was a taut and convicning inter-racial police procedural that won several Oscars in 1967; Tarantino's 2012 Django Unchained took an ironic post-midern look at slavery as well as updating the western genre. Stanley Kramer's 1958 movie The Defiant Ones focused on two escaped chain-gang convicts, one black, one white who have to evade their pursuers. 1988's Mississippi Burning was based on two FBI agents trying to find those responsible for outbreaks of racial violence.